In strength coaching circles, there’s a highly effective hamstring exercise that is well known to coaches, athletes, and sports medicine personnel. 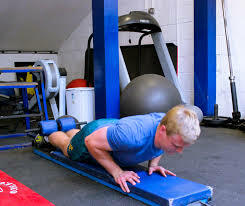 The exercise has many names, including the Russian leg curl, Russian lean, Russian ham curl, kneeling Russian hamstring curl, Nordic ham curl, Nordic hamstrings, Nordic hamstrings lower, Nordic leg curl, Nordic reverse curl, glute-ham curl, bodyweight leg curl, natural hamstring curl, and bodyweight hamstring curl. The most common name used in the literature is the Nordic ham curl (NHC). These exercise variations typically involve kneeling on a pad and lowering under control while the ankles are held in place by a partner, a lat pulldown apparatus, a sit-up apparatus, a loaded barbell, a poor man’s glute-ham apparatus, or any other immovable object you can think of using. Here’s a video of my sister from several years ago busting out 3 reps.
Can eccentric training help prevent hamstring strains? If you’re a strength coach or physical therapist, then you should definitely include the NHC in your arsenal. There’s a wealth of research behind it, and there’s no doubt that it can help prevent hamstring strains. Moreover, knee flexion torque is highly correlated with sprint speed, and the hamstrings contract to both extend the hips and flex the knees during sprint running (and this is vital during the window immediately before, during, and immediately after the foot strikes the ground). So knee flexion shouldn’t be omitted in sport training. But before I delve further, I want to be very clear about something. Possessing high levels of eccentric hamstring strength does not guarantee that hamstring strains will not occur. In Hamstring strain injuries: are we heading in the right direction?, Mendiguchia et al. explain how hamstring strains are predicted by the interrelated nature between flexibility, strength, fatigue, core stability, architecture, and previous injury. An athlete could possess sound levels of hamstring strength to absorb eccentric stress, sound levels of hamstring flexibility to lengthen sufficiently during high load activity, and sound levels of core stability to prevent aberrant pelvic motion, but still wind up with a hamstring strain due to excessive fatigue, a prior injury, or simply a skeletal anatomy or muscle architecture that lends itself to large strains on the hamstrings. Furthermore, the NHC works primarily on knee flexion. In sports, the knee joints do not move independently from the hip joints; they work in concert with one another. Moreover, hip extension exercises stretch the hamstrings to a greater degree than knee flexion exercises. Therefore, it is very important to perform hip extension exercises as they will lead to a greater stretch in the hamstrings, and they are more specific to sport movement. Can the NHC pack on serious hamstrings muscle mass? I believe it can. Take a look at a study conducted by Ebben et al. which showed that NHCs (in this study they were called Russian Curls or RCs) outperformed seated leg curls, stiff leg deadlifts, single leg stiff leg deadlifts, good mornings, and squats in hamstring EMG activity. As you can see, the NHC is no joke. Now, there are several articles in the literature investigating hamstring EMG activity, and they show conflicting results, probably because hamstring activation is highly influenced by the precise placement of the electrodes along the length of the muscles. At any rate, the NHC undoubtedly leads to high levels of hamstring muscle activation and should be included in a comprehensive hamstring strengthening protocol, especially in conjunction with other exercises such as Romanian deadlifts (RDLs), glute ham raises (GHRs), and lying leg curls. RDLs, GHRs, and NHCs are well-suited for producing high levels of tension and damage, whereas lying leg curls are well-suited for producing high levels of metabolic stress. In this article, I’d like to impress upon you what I believe is a more effective NHC variation compared to the standard exercise. The vast majority of lifters and athletes are not strong enough to adequately control the lowering portion of the exercise throughout the entire range of motion (ROM). Almost inevitably, athletes lower their bodies under control during the first half of the movement and then sink like a ship during the second half of the movement. This rapid descent is accompanied by a sharp decline in muscle activity. To prevent this occurrence, the lifter can simply use a band to provide assistance, which kicks in more and more as the lifter descends into the latter portion of the movement. This is importance since the torque angle curve of the NHC is sharp such that the most torque out of the knee flexors is required at the end of the movement when the muscle is lengthened (but it’s important to realize that in a NHC, the hamstrings don’t even reach resting length at their maximum stretch). Of course, not every athlete needs the band assisted version of the NHC. Take a look HERE at former NFL athlete Adam Archuleta – skip to the 2 minute and 32 second mark and watch Adam bust out NHCs with ease. But guys like Adam are the exception, not the norm. In the video below, you can see that I’m able to control my body throughout the entire range of motion. In fact, I don’t even have to use my arms to “push up” and provide assistance. I hope that you give this variation a try, I think you will find it to be more effective than the traditional version, at least until you build up enough strength to sufficiently control your bodyweight during the eccentric phase without the use of bands. Below is a list of over 100 linked journal articles that investigate, program, discuss, or recommend the Nordic Ham Curl exercise. A 10-week randomized trial comparing eccentric vs. concentric hamstring strength training in well-trained soccer players. Effects of a low volume injury prevention program on the hamstring torque angle relationship. Medial hamstring muscle activation patterns are affected 1-6 years after ACL reconstruction using hamstring autograft. Human hamstring muscles adapt to eccentric exercise by changing optimum length. Hamstring activation during lower body resistance training exercises. Preventive effect of eccentric training on acute hamstring injuries in men’s soccer: a cluster-randomized controlled trial. Kinematic and electromyographic analysis of the Nordic Hamstring Exercise. A novel device using the Nordic hamstring exercise to assess eccentric knee flexor strength: a reliability and retrospective injury study. The preventive effect of the Nordic hamstring exercise on hamstring injuries in amateur soccer players: study protocol for a randomised controlled trial. Effectiveness of injury prevention programs on developing quadriceps and hamstrings strength of young male professional soccer players. Risk factors, testing and preventative strategies for non-contact injuries in professional football: current perceptions and practices of 44 teams from various premier leagues. Eccentric Hamstring Strength and Hamstring Injury Risk in Australian Footballers. The Effect of Previous Hamstring Strain Injuries on the Change in Eccentric Hamstring Strength During Preseason Training in Elite Australian Footballers. The Validity of the Nordic Hamstring Lower as a Field-Based Assessment of Eccentric Hamstring Strength. Evidence-based treatment of hamstring tears. ‘Nordic’ hamstrings exercise – engagement characteristics and training responses. Exercises to prevent lower limb injuries in youth sports: cluster randomised controlled trial. The Assisted Nordic Hamstring Curl. The Nordic Eccentric Hamstring Exercise for Injury Prevention in Soccer Players. Training Considerations after Hamstring Injury in Athletes. Isokinetic strength effects of FIFA’s “The 11+” injury prevention training programme. Performance Enhancement Effects of Fe´de´ration Internationale de Football Association’s “The 11+” Injury Prevention Training Program in Youth Futsal Players. Effects of the 11+ and Harmoknee Warm-up Programs on Physical Performance Measures in Professional Soccer Players. Strength and power characteristics in English elite rugby league players. Altering the length-tension relationship with eccentric exercise : implications for performance and injury. Kettlebell swing targets semitendinosus and supine leg curl targets biceps femoris: an EMG study with rehabilitation implications. Preventing Hamstring Injuries in Sport. Bridging the Gap Between Content and Context: Establishing Expert Consensus on the Content of an Exercise Training Program to Prevent Lower-Limb Injuries. Biceps Femoris Long-Head Architecture: A Reliability and Retrospective Injury Study. Clinical and morphological changes following 2 rehabilitation programs for acute hamstring strain injuries: a randomized clinical trial. Development and validation of a questionnaire (FASH—Functional Assessment Scale for Acute Hamstring Injuries): to measure the severity and impact of symptoms on function and sports ability in patients with acute hamstring injuries. Differences in activation patterns of knee flexor muscles during concentric and eccentric exercises. Eccentric exercise: mechanisms and effects when used as training regime or training adjunct. Eccentric exercise training: modalities, applications and perspectives. Eccentric Muscle Actions and How the Strength and Conditioning Specialist Might Use Them for a Variety of Purposes. Effect of hip flexion angle on hamstring optimum length after a single set of concentric contractions. Effects of a 10-week in-season eccentric overload training program on muscle injury prevention and performance in junior elite soccer players. Evidence based prevention of hamstring injuries in sport. Examination and treatment of hamstring related injuries. Hamstring exercises for track and field athletes – injury and exercise biomechanics, and possible implications for exercise selection and primary prevention. Hamstring injury rehabilitation and prevention of reinjury using lengthened state eccentric training: a new concept. Hamstring Strains: Basic Science and Clinical Research Applications for Preventing the Recurrent Injury. 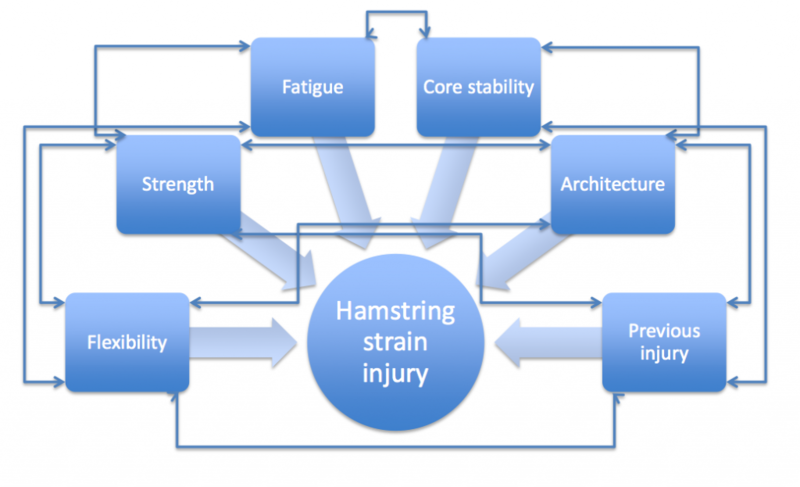 Hamstring strain injuries: factors that lead to injury and re-injury. Interventions for preventing hamstring injuries. Prevention of injuries among male soccer players: a prospective, randomized intervention study targeting players with previous injuries or reduced function. A pilot randomised controlled trial of eccentric exercise to prevent hamstring injuries in community-level Australian Football. Hamstring Strain Prevention in Elite Soccer Players. Strength deficits identified with concentric action of the hip extensors and eccentric action of the hamstrings predispose to hamstring injury in elite sprinters. Influence of Hip-Flexion Angle on Hamstrings Isokinetic Activity in Sprinters. Intrinsic risk factors for hamstring injuries among male soccer players: a prospective cohort study. Lower eccentric hamstring strength and single leg hop for distance predict hamstring injury in PETE students. Methods of Developing Power to Improve Acceleration for the Non-Track Athlete. Neuromuscular training improves knee kinematics, in particular in valgus aligned adolescent team handball players of both sexes. Risk factors for hamstring injuries in male soccer players: a systematic review of prospective studies. Specific exercise effects of preventive neuromuscular training intervention on anterior cruciate ligament injury risk reduction in young females: meta-analysis and subgroup analysis. Strength and Conditioning for Soccer Players. The effect of an eccentrically-biased hamstring strengthening home program on knee flexor strength and the length-tension relationship. The effect of combined resisted agility and repeated sprint training vs. strength training on female elite soccer players. The effectiveness of different exercises protocols to prevent the incidence of hamstring injury in athletes. The effects of isometric and isotonic training on hamstring stiffness and anterior cruciate ligament loading mechanisms. The effects of resistance training prioritization in NCAA Division I Football summer training. The Order of Concurrent Training Does not Affect Soccer-Related Performance Adaptations. Which screening tools can predict injury to the lower extremities in team sports? : a systematic review. Neuromuscular training improves performance and lower-extremity biomechanics in female athletes. The effects of plyometric vs. dynamic stabilization and balance training on power, balance, and landing force in female athletes. Does eccentric training of hamstring muscles reduce acute injuries in soccer? Eccentric hamstring muscle training can prevent hamstring injuries in soccer players. Good stuff, Bret! Definitely an underutilized exercise. One question — do you find there to be any redundancy between GHR’s and NHC’s? Also, great choice of tunes for the vid. I love Angus and Julia Stone! Good question Trav. Yes, they’re almost duplicates. Sort of like doing squats and front squats in the same session. So I just pick one of them. Out of curiosity, are you able to do NHCs if someone holds onto your prosthetic leg? I would assume that you’d have a serious strength imbalance favoring the normal leg. And this was my brother’s music playing haha, I didn’t know who it was. Your brother has excellent taste. Like most folks, I have decent control over the eccentric phase of the NHC, but I struggle to get back up without a strong push from my arms. Even when I’m wearing my prosthesis, since I don’t have knee flexors on that side, I’m essentially doing them single leg. I’m excited to experiment with band assistance! Travis, thanks for getting back to me. This is a strange circumstance in which I’m asking all the questions in the comments section of my blog. I went back and looked at the pictures from your guest blog (http://bretcontreras.com/glute-bridge-best-amputee-case-study/). I forgot that you didn’t have many femur muscles. I don’t know how in the heck you could possibly lower your torso under control with only one hamstring group! I would get 5 degrees into the movement and dive bomb. But I know there are guys who can do this – I think my friend Ben Bruno can do 1-leg GHRs So yeah, I think you’ll like the band assisted version much better. Thanks for providing such great content! It’s a good thing when your readership is so engaged that you can learn from them, as well, right?! Indeed, no left knee, so no muscles crossing it either. With the one leg, I’m usually decent for the first half of the eccentric ROM, but I definitely lose control at the end. I hope to get a chance to play with the band assistance later today. Ben Bruno is a freak! Glad you liked it Matt, and nice of you to reference my new favorite Buttman shirt haha. Hey Bret, my teacher, Ido Portal, prescribes this exercise (he calls it the Harop curl; never found the chance to ask him why), but with the concentric portion included (like this: https://www.youtube.com/watch?v=Y7ndeehIOhU). Never really knew why it’s always considered an eccentric exercise, but maybe it has to do with the fact that it was big in the rehab world, where eccentrics end up being so useful? Hi Sean, Ido makes that look way easier than it is haha. I wonder why he calls it the Harop curl, probably named after some guy he studied after. It’s funny you say this – even the NHC is a full dynamic movement with a concentric and eccentric phase. It’d only be a true eccentric if you made it to the bottom and then picked your body back up (or had someone help you) without using your hamstrings whatsoever. Even when performing an explosive push-up out of the bottom, it’s still hard for many people to pull themselves up with their hammies (but they’re still contracting them concentrically). I suppose we refer to them as eccentrics because the goal of the movement is to lower the torso to the ground as slowly as possible, with an accentuation on the lowering portion. Great article! NHC’s could also be utilized to prevent ACL injuries since we know most are due to poor quad to hamstring ratio. Yep, they’re used in many ACL injury prevention programs. Personally I think that hip extension exercises are better suited for this since I believe they will more aptly contribute to decreasing the net knee extension moment and the net knee abduction moment when landing from a jump. But it definitely can’t hurt to include them in a program. 1. The force velocity curve of a muscle. Greater eccentric muscle force is produced at higher velocities. Higher velocities obviously occur during running and sprinting when compared to the velocity of the NHC exercise performance. Certainly an appropriate strength based must be established prior to the implementation of higher speed (i.e. power/velocity) exercise performance and training but a progression to higher speed activities should occur for optimal eccentric muscle training. 2. There is a neuromuscular component to hamstring injuries as well. The short head of the biceps femoris is innervated by the common peroneal nerve while the long head of the biceps femoris is innervated by the tibial nerve (along with the semitendonosus and semimembranosus). Thus there is a factor of neuromuscular “timing” between muscle groups during high speed movement. This is similar to the glenohumermal/scapulothoracic neuromuscular positioning and timing that occurs at the glenohumeral joint during pitching. 3. Fatigue – Appropriate program design is essential to prevent excessive fatigue during training. Excessive fatigue of a muscle/muscle group will have a negative effect on both joint kinematics and force production during training setting the table for possible injury to occur. In my experience many athletes don’t sprint enough. Often times much “tempo” type exercise performance is prescribed, which is appropriate, but not enough sprinting volume is programmed. Appropriate volumes of sprinting will train the hamstrings to produce optimal levels of high speed eccentric muscle force as well as ensure the neuromuscular timing mechanism previously mentioned. Although the NHC may be considered a valuable exercise in the “toolbox” of hamstring training, activities of higher velocities are also necessary for optimal hamstring performance and injury prevention. Great points Rob! I agree with all of them. Always appreciate your input my friend. Bret what do you recommend for foot position when doing the NHC with someone holding our feet? or are we dorsiflexed with great toe extension? Good question – I prefer dorsiflexed with great toe extension as it makes for stronger knee flexion and a more productive eccentric phase. Prior research with leg curls showed that the hammies are weaker in plantarflexion, but EMG activity is similar since the hammies will be working as hard as they can when plantarflexed (with lighter loads) or dorsiflexed (with heavier loads). Nice article Bret and great reference list! I’ll be sure to check out some of those as there’s no doubt plenty I hadn’t seen. The band-assisted option is a great one that’ll I’ll be sure to play around with. However, it also looks a little cumbersome to set up for clients in a rush. I agree that most people, especially gen pop clients, are nowhere near strong enough to perform the Nordic curl right off the bat, and I’ve found most will simply cramp up within the first couple of inches of motion. I’ve taken a different approach to progressing clients to the Nordic curl by using the SHELC, which I really believe is under-appreciated when performed correctly. Quick aside: That’s sports scientist David Buttifant, formerly of the Collingwood Football Club here in Melbourne shown in the photo at the top. I had the pleasure of listening to him and speaking with him at a couple of workshops over the years. Smart dude, and has contributed some handy research on hamstring injuries and glute activation. Wow, really appreciate the kind words Bret! Thank you very much. I have this post of yours bookmarked, Will! Very comprehensive. And I definitely agree that the NHC can be a bit of a nightmare to set up if you’re pressed for time. Thanks Travis. For me, SHELCS serve as the PREgression to NHC’s. Just seems to work well to prep the hamstrings for the eccentric load. Just stumbled upon this as i wanted to properly get myself ready to start doing these and going to take a look at SHELCS to start me off and progress into the nordic. Great stuff man. Is it better to do these with some hip flexion (like I see in the vid of you and your sister), or to aim for a straight line from your knees up? Good question Steven. The way I learned was to do these in full hip extension. Every expert I can think of advised this. But lately I’ve been thinking that it’s better to do them in slight hip flexion; the reason being that you’re stronger this way, and it lengthens the hammies a bit. It’s generally a good thing to strengthen the hammies at longer muscle lengths for sports purposes, and I always feel the movement slightly more in the hammies when hips are flexed slightly (this applies to GHRs, NHCs, and even lying leg curls). However, it may depend on the person, so experiment and see what feels best to you; you might feel that it’s more productive to keep the hips in full hip extension. I’m surprised no one has mentioned the utilization of the RDL for hamstring muscle enhancement and injury prevention. The most injured hamstring muscle is the biceps femoris (BF) due to its greater peak muscle length under tension, as well as the “neuromuscular timing” mechanism mentioned previously, when compared to the other hamstring muscles. Differences in the hip extension and knee flexion moment arms between the biarticular hamstrings may account for the intermuscle variations in these peak muscle lengths. Most hamstring (BF) injuries occur at the terminal swing phase (muscle length tension) at the time of initial ground contact during transition from swing to stance (neuromuscular timing between the long and short head of the BF). So if we think of the RDL exercise performance, this exercise is performed (a) in the standing position (the posture that we assume for both running and athletic performance) allowing for greater muscle length under tension, (b) the exercise is performed with a slight knee flexion angle that replicates the knee flexion angle at the time of foot contact as well as the knee flexion angle that occurs during mid-stance, (c) produces greater muscle length under tension when compared to the NHC or similar exercises as during NHC exercise performance the knees are initially flexed to 90 degrees and rarely is the athlete able to assume an extended knee position that replicates the knee angle described above, and (d) if performed properly, the RDL enhances hamstring/hip extensor and low back strength. He doesn’t even mention Diet (stiffness/compliance related). Bret, If the muscle is lengthening, what is the hamstring tendon doing?, shortening, lengthening or stays the same?. Quick question. Hamstrings tears are very common when sprinting. Why aren’t glutes tears more common is both hamstrings and glutes are the 2 most used muscles groups. Love the way you demystify with science. How often do you recommend for an adult. Also for young females in the 12-14 age group; ok to start. While it may be a great exercise, for me it puts way too much pressure on my patellae. I have to be very careful with the cartilage on my kneecaps, as I already have chondromalacia patella in one of them. Great article. I’ve been doing nordic hamstring curls and band hip thrusts for almost a year now to help deal with some self-diagnosed high hamstring tendinopathy (sp?) and a very tricky back. I find both exercises to be extremely helpful in keeping me relatively injury-free. What might be of interest to you is how I go about doing these exercises: since I don’t belong to a commercial gym, I needed to find a way to do these exercises with a minimum of equipment. If you have ever tried to do a nordic hamstring curl without a partner or the proper equipment, you may have noticed there is no such thing as an immovable object of furniture in your household. The leverage produced by the activity could lift a small car and I’m only 170 lbs. So I built a wooden apparatus based on a design I saw on youtube. But even a wooden foot restraint, with hammer and nails won’t hold for long. Which made me think there might be a simple add-on you could add to the design of your Hip Thruster bench. The fixed back rest of the Hip Thruster could be modified to accommodate a foot restraint to do Nordic Ham exercises. You would have to add some kind of firm padding to the underside of the back rest to reduce the distance between the back of the leg/ankle and the ground but it would probably add next to no weight to the apparatus and would not increase the space requirement by even a millimetre. Then all the user would need is a good cushion for the knees and the Hip Thruster could double as a Nordic Ham bench. This would be much more safe and reliable than the wooden bench I’ve constructed for myself. Love the content, and have heavily looked at this exercise, especially for the training of martial art athletes (specifically MMA, and Jiu-Jitsu) I really wanted to leave a comment, because in your recent podcast about Mark Rippetoe, you talked about people that commented, I just want to know, you have some smarter than average commenters on here (including me)! Thank you again, have a great year. Very interesting article you have here. My question is what is the best poor man’s glute ham raise machine to use for this type of exercise? Thanks alot for this article Bret! When i herniated my L5-S1 disc (badly) 6 months ago i was forced to remove all exercises that caused an anterior pelvic tilt (all kinds of deadlifts), so for my hams this has been my main exercise for the last 6 months and i LOVE it! My hams have never been stronger and in the past i used to get a grade 1 tear in my semimembranosus (near knee) ~3 times a year, but the last 6 months with NHC i haven’t had it once! When i started i couldn’t do a single rep without the assistance of my arms, which is kind of funny since i used to work within the 8-10 rep range with 400 lbs in RDL, so i had to use bands like you recommended, today i can do 3×6 (2 min rest) full reps with my bodyweight. This is an excellent exercise. Though it’s so often used as a hamstring builder (which, undoubtedly, is true), I like to think of it as an anti-flexion core stability exercise. As you descend further into the bottom position of this movement, the moment arm increases, thus requiring the hamstrings, glutes, and lower back to stay tight and prevent hip or lumbar flexion – unless you are actively performing it with flexed hips, in which case the spinal erectors are doing most of the work. Pair this with some rollouts or stir-the-pot’s and an unstable side plank variation, and you have a killer pre- or post-workout core training sequence. Bret great variation. What do you think of using a super band around ankle and immovable object so when foot is lifted off the ground the band pulls lower leg out? The object would be to control lower leg movement much like what the hamstring does during running. Could also try to run in place. I don’t mean to imply that this exercise would by any means be a better exercise than anything else but instead to see what you think of its worth. Thanks. Hello Bret, what about the NHC for improving sprinting performance ? I am talking purely about direct transfere to speed, not adding hamstring mass nor injury prevention ! How much added weight should an elite do in the NHC full range of motion ? Hey Bret, I’ve recently been doing back (hip) extensions with a NHC set up. So, like, kneel tall, fix the ankles, then hinge. IINM, this works the hamstrings dynamically to extend the hips while they isometrically resist knee extension. I’ve never seen anybody recommend this exercise, so can I name it Nordic Hip Extension?